. . . I can't stand still, I've tried it, I can't do it . . . This is Hour Seven of the First and Original History Of Rock And Roll, as broadcast by KHJ between 6 and 7PM on February 21, 1969. Our host is Robert W. Morgan. Charlie Tuna is heard throughout as the "announcer on duty". Recorded off the air on reel tape by contributor Don Kent, this program defined all the "music documentary" programs that followed. It was the first, produced by KHJ Program Director Ron Jacobs. Following the unprecedented success of this legendary broadcast, Jacobs left KHJ later that year. RKO made the show available to the other stations in their group, narrated by station-specific talent. When RKO was done with it, Drake-Chenault offered a re-recorded version in syndication three times between 1972 and 1982. An edited version (no jingle) of the last release, narrated by Bill Drake, was still in syndication as of 2006. 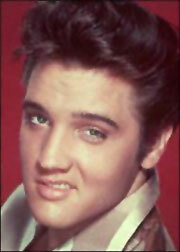 This original KHJ Hour focuses on the first rock 'n' roll superstar, Elvis Presley. Included are comments from Elvis, and comments about Elvis from music legends Carl Perkins, Fats Domino (who admits he couldn't understand the words on Elvis' first record), Little Richard, Bill Haley and Bones Howe. This aircheck also includes a delightful sample of first-class KHJ advertisers, beginning with the opening spot for Continental Airlines (the proud bird with the golden tail), the Neil Diamond (sound-alike or the real-thing?) jingle for Buick (wouldn't you really rather?) and Wiki Wiki Dollars for Chevron. 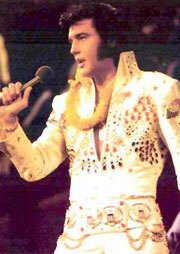 Morgan also offers a list of the "Elvis Products" being merchandised at the peak of Presley's popularity. The morse code REELRADIO "copymark" included in this exhibit is a reminder that duplication and distribution for trade or sale is illegal and inappropriate. Tell your friends who want to hear this recording to subscribe to REELRADIO and support our organization. ©1996 - 2008 REELRADIO, Inc.